Interesting alternative to spend some time swimming in Manhattan. Is it not your first time here? Tell us how it went using the Facebook comments beneath or contacting us directly! 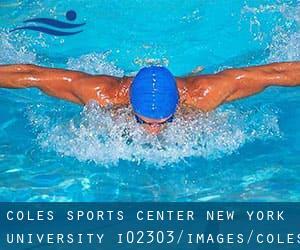 Coles Sports Center - New York University is only one of all the swimming pools Swimia is providing you, and its information has been shared with us by a swimmer like you.Remember you can now promote Coles Sports Center - New York University by sharing this page with your pals, adding comments and linking to us. This sports center offers 25 meters x 45 feet, 6 lanes, Indoors. For this Pool, only phone number is number here. Updated on 2019 1605 Broadway, 15th Floor , Midtown / Times Square , New York , NY , USA (Postal Code: 10019). This sports center delivers 50 feet x 18 feet, 4 lanes, Indoors. For this Swimming Pool, only phone number is number here. Updated on 2019 39 Whitehall Street , Financial District , New York , NY , USA (Postal Code: 10004). Among all of the activities offered by the center, if you are considering swimming you might delight in 60 feet, 2 (wide) lanes, 3 feet - 5 feet depth, Indoors. If you must contact this Swimming Pool, e-mail address and phone number are both number. 899 - 10th Ave. , Midtown , New York , NY , USA (Postal Code: 10019). Swimmers like you reported 25 yards, 5 lanes, Indoors. Unfortunately we do not have the email address of this Pool, but we can provide you with the phone number. 430 West 25th Street (between 9th & 10th Avenue) , Chelsea , New York , NY , USA (Postal Code: 10001). Among all the activities offered by the center, should you be considering swimming you'll delight in 25 yards, 6 lanes, Indoors. Just in case you would like to contact this Swimming Pool before dropping by, we only know the phone number. 203 W. 58th Street , Columbus Circle , New York , NY , USA (Postal Code: 10019). This sports center gives An Endless Pools adjustable current pool, Indoors. For this Swimming Pool, only phone number is number here. 392 Asser Levy Place , Gramercy Park , New York , NY , USA (Postal Code: 10010). Swimmers like you reported 22 yards x 26 feet, 3 lanes, 8 feet depth, Indoors. Unfortunately we do not have the e-mail address of this Swimming Pool, but we can provide you with the phone number. 344 E. 14th St. , New York , NY , USA (Postal Code: 10003). Among all the activities provided by the center, for anyone who is thinking about swimming you will delight in 20 yards x 25 feet, 4 lanes, Indoors. If you need to contact this Swimming Pool, email address and phone number are both number. 334 Amsterdam Ave. at 76th St. , Upper West Side , New York , NY , USA (Postal Code: 10023). Swimmers like you reported 25 meters, 5 lanes, Indoors. Unfortunately we do not have the email address of this Swimming Pool, but we can provide you with the phone number. Updated on 2019 5 W. 63rd St. , Upper West Side , New York , NY , USA (Postal Code: 10023). Few days ago a normal user of this center told us they offer 25 yards x 25 feet, 4 lanes, Indoors. Furthermore, they keep in good conditions 20 yards x 20 feet, Indoors. For this Swimming Pool, only phone number is number here. 533 W. 59th St. , Hell´s Kitchen / Columbus Circle , New York , NY , USA (Postal Code: 10019). Among all of the activities offered by the center, if you are interested in swimming you may get pleasure from 20 yards x 35 feet, 4 lanes, 8 feet depth, Indoors. Just in case you would like to contact this Swimming Pool prior to dropping by, we only know the phone number.